In the dream, we know something is wrong when I notice the constellations have all disappeared. All that remains in the night sky is the deep black of space, and a few sets of stars — in triplets and doubles, shining like it was the dead of winter. The stars are going out, and we’re not certain what that means, except we know that something is happening in our sky. Is the atmosphere changing? Is it space? Time itself? Are we living out a Robert Charles Wilson novel? We can feel the effects on our skin first. Like a mix of hoarfrost and gooseflesh, we can feel our flesh freezing and drying; it’s almost painful. The best solution seems to be get underground, and so we run for the nearest structure — an apartment building — and pile into the elevator. As we hit the button for the basement, we can hear screaming somewhere in the building, and the hair on my arms rises on end. St. Elmo’s Fire plays along the top metal edge of the door. When we get to the basement, the doors open and then the power dies. All is silence. There are three of us. Two women and me. I’m not sure who the women are, what we were doing before the stars began to disappear, or even who they may represent. The basement hallways are filled with black garbage bags, the doors lead to storage rooms, and complexes of machinery that have died with the power. We push our way through the black bags, and find a lone apartment to hide in. The rooms are musty, and one of them is about waist-deep in water, looking more like a marsh or bog than an inside space. A large plate-glass window fills one entire end of the room, and it looks out on a plateau filled with scrap metal and power lines. The tree-lined horizon is dimly visible, the black foreground of a spectacular aurora that fills the sky. There are arcs of light flashing on the ground. The stars have disappeared now. 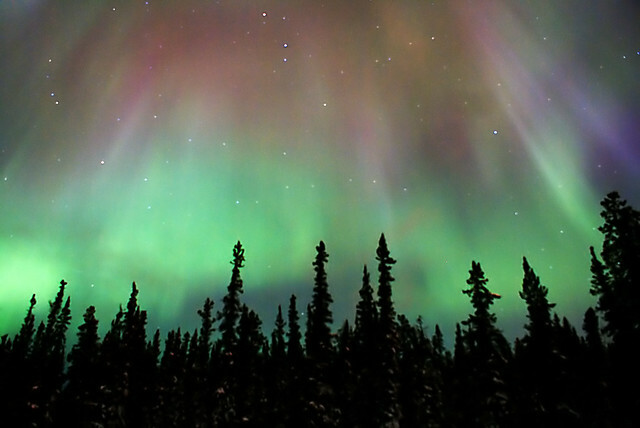 Then the aurora dies in a spasm of color. There is only the empty black of space and the sparks on the ground. Some of the scrap metal is popping and jumping with the bursts of light — sometimes blue, sometimes bright white — and they seem to be pushing the metal uphill towards the window. We all know, instinctively, that when the window is breached the radiation that is causing all of this will fill the room, and we’ll die. We run back into the kitchen of the dingy apartment, closing the door behind us; in the dream we work as one, and start finding pieces of metal to pile against the door, in the hope it will protect us from the radiation. I take apart the fridge and put the fridge door next to the marsh-room door, just in time apparently, for I can hear the glass shattering, the rush of water as it heads out to the plateau. The sound is raw and terrifying after the eerie silence. Light limns the fridge door, the metal begins to sparkle and pop, and I can feel their hands grasp mine.